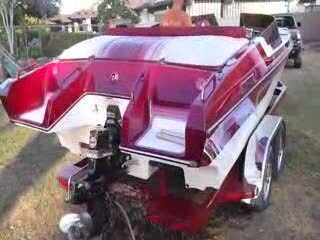 GREAT RUNNUNG BOAT EXCELLENT CONDITION. VERY CLEAN HAS A 454 WITH A BRAVO ONE. NEW BOAT COVER AND BIMINI TOP. LOUD SOUND SYSTEM. BOAT HAS 483 HRS AND STILL RUNS STRONG. ALWAYS GARAGED AND SERVICED. 234 Edge Eliminator running in the yard and walk around.